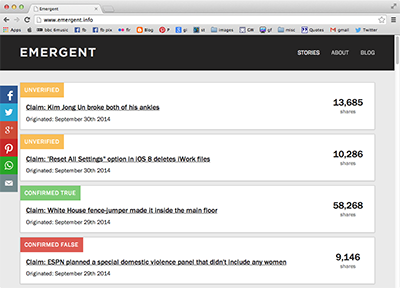 Emergent is a real-time rumour tracker. It's part of a research project with the Tow Center for Digital Journalism at Columbia University that focuses on how unverified information and rumour are reported in the media. It aims to develop and best practices for debunking misinformation. You can view a list of rumours being tracked on the homepage, along with their current claim state (True, False, Unverified). Click on a story to visit a page that visualises the sources reporting the rumour, and a breakdown of social shares per source. You can also click on individual articles on the story page to see specific revision and social share data about that article.